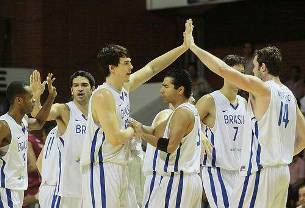 NEIVA (2010 South American Championship) - In a well fought game, Brazil defeated Venezuela 79-67 to play for the Gold medal game against Argentina at 21:00 local time. The Bronze medal game is Venezuela against Uruguay at 19:00. Murilo Becker had 25 points, Rafael Ferreira 15 and Arthur Luiz 10 for the Brazilians who made 44 of their points in the paint. Becker was the constant figure for Brazil, dominating the paint and making the offense easier for his teammates. The first quarter was for Venezuela 20-18 as Becker had 9 points while Rafael Perez led Venezuela with 6. Venezuela kept their consistent attack in the first half and kept the Brazilians with Becker as their only weapon. The first half ended 36-35 in favor of Venezuela. In the second half the points off second chances and the long distance shots started to fall for Brazil who took control early in the third quarter and finished up 57-50. In the final ten minutes Brazil kept control with a double digit lead in order to stay undefeated. Rafael Perez had 22 points and Hector Romero 12 for Venezuela.